I’m a huge fan of the BBC journalist Peter Day. 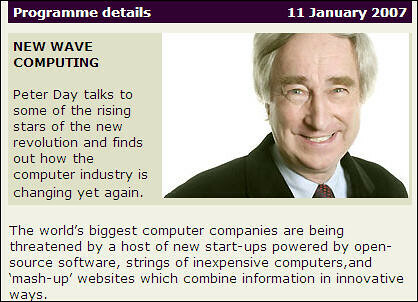 He presides over the brilliant Radio 4 programme In Business and is often to be heard on the World Service. He’s an intelligent broadcaster seeking out the new with an amazing ability to ask that killer question or pursue an incisive hunch. His latest In Business is a superb introduction to the world of open source, internet mash ups and how these new trends are challenging the Gateist norm. Even as someone with a reasonable amount of industry knowledge, this was an entertaining and informative bit of radio. It’s a good sideways look at Web 2.0, whatever Web 2.0 is. Trust me, it’s half an hour well spent. Check out the BBC website to listen again in the next week or grab the podcast.